The blockchain technology market is estimated to grow to $2.3 billion by 2021. Since its inception in 2008, blockchain has evolved to find applications in almost every industry. It has become a vital technology for business as it provides transparent and trustworthy transactions. More and more companies are exploring and developing their own blockchain technology-based application. Both well-established and startup enterprises are focusing their resources to harness the power of blockchain. 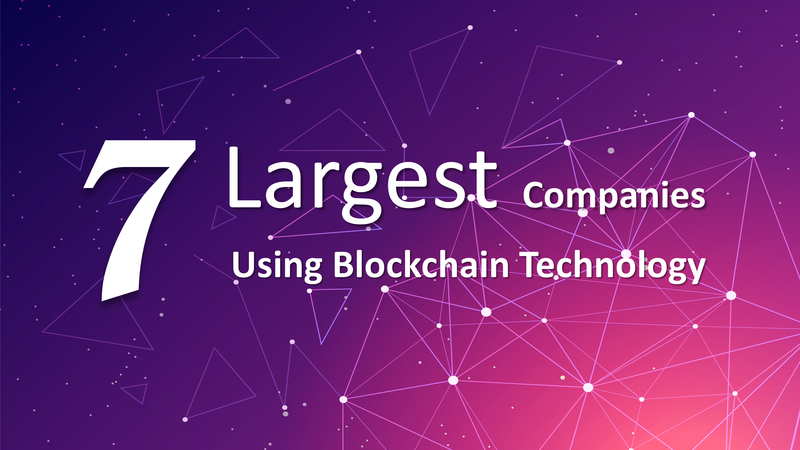 Here’s a look at 7 of the largest blockchain technology companies. In 2015, Microsoft Azure was the first platform to bring blockchain services to the cloud. Microsoft has been developing blockchain applications, although its main aim is to enable developers to build their own apps, such as the Ethereum-based protocol, Confidential Consortium (Coco). Microsoft has also connected its blockchain services to other platforms, such as Office 365 Outlook, Salesforce, SharePoint Online, SAP, Dynamics 365 CRM Online and even Twitter. This will allow Microsoft users to store their data on the cloud and from there, it will be stored onto a blockchain, in a standardised format. IBM has been one of the earliest tech giants to explore the potential of blockchain. IBM has over 1,500 employees working on various projects based on blockchain. It has worked on more than 400 blockchain-based projects, spread across the finance, retail, healthcare, media and other sectors. IBM was awarded a patent for a blockchain-based network security system in October 2018. This security system will help companies set up their own system to track attempted attacks on their distributed network, with the use of node agreements to raise an alarm against any breach or irregularities. IBM has developed the IBM Blockchain Platform, on the open-source Hyperledger software from the Linux Foundation. It is an integrated, business-ready platform that deals with developing, governing and operating the blockchain network. Walmart has started using this software to monitor its food supply chain. IBM and Maersk, the European shipping and logistics giant, have joined hands to develop blockchain applications for supply chains. Amazon Web Services (AWS), the cloud computing arm of Amazon, has started providing Blockchain as a service (BaaS). Amazon is all set to provide AWS blockchain templates, which aim to offer a quick and easy means to develop and utilise secure blockchain networks, using the popular open source framework, such as Ethereum and Hyperledger Fabric. AWS has Blockapps, Cisco, Guildone, Intel, Kaleido, Manifold Technology and CORDA R3 as its technology partners to provide blockchain solutions, with support for multiple protocols. The very first sector that blockchain revolutionised was the financial sector. Bank of America has emerged as the most active enterprise in this segment to invest in exploring the potential of blockchain in finance and file patents for innovations based on this technology. Bank of America has around 50 patents associated with blockchain innovations, making it a frontrunner in the race to file and win patents over IBM and other tech giants. Recently, Bank of America has applied for a blockchain-based, encrypted, crypto storage system patent. In 2017, Visa, the global credit card giant, launched the first phase of its blockchain-based B2B payment service, B2B Connect. This service has been developed with the assistance of blockchain startup, Chain. It aims to provide a safe, easy and fast means of cross border payments. It cuts out the middleman of previous payment systems, reducing costs in the process. Visa has been working on this project with US-based Commerce Bank, South Korea’s Shinhan Bank, the Union Bank of Philippines and the United Overseas Bank in Singapore. In July 2017, Oracle launched its Blockchain as a Service (BaaS), months after rivals, such as IBM and Microsoft, had launched their own BaaS. It aims to provide blockchain services to companies hoping to utilise blockchain technology in their operations, without bearing the costs associated with embracing the technology. Oracle’s service has been developed on Linux’s Hyperledger Fabric and supports interoperability with non-Oracle Hyperledger Fabric-based systems. Oracle’s BaaS has already been adopted by Arab Jordan Investment Bank, CargoSmart, Certified Origins, Intelipost, Nigeria Customs and Solar Site Design. Oracle’s blockchain services are already helping to ease transactions, track goods through supply chains and reduce costs. The structure of Ethereum is similar to that of Bitcoin, although it offers many more applications than just peer-to-peer electronic transactions. Ethereum allows developers to create applications or agreements that have extra steps and new rules of trading. It has incorporated smart contracts, which help facilitate, validate and execute the terms of a contract. In Zug, Switzerland, a blockchain-based ID is being used. This system is called Uport and runs on an Ethereum blockchain ledger. It is a self-sovereign identity and user-centric data platform. IBM and Samsung have developed their blockchain solutions on the Ethereum platform. Similarly, Innoplexus has launched iPlexus™, also developed on Ethereum, to assist the drug discovery industry. This is a one-of-a-kind platform where pharma companies can peruse and search through a large database of information that would otherwise be inaccessible. It will reduce the capital needed for R&D in the pharma industry. Blockchain technology certainly has the potential to revolutionise business, if not our daily lives. Cryptocurrencies are already being accepted across the world for monetary transactions. Innovations are taking place almost on a daily basis, increasing the scope of blockchain. Major corporations are investing large sums of money to exploring the potential of this technology, which will only drive the mainstream adoption of blockchain and cryptocurrencies. The list does not stop here. The future of blockchain technology is limitless. Companies, regardless of structure & industries are beginning to see its huge potential. 2019 will be colored with many headlines of businesses innovating through blockchain technology. Learn how blockchain technology will revolutionize the travel industry! James Weaver, 2018. The 7 Largest Blockchain Technology Companies [online]. Available from: https://www.tokentarget.com/the-7-largest-blockchain-technology-companies/ [Accessed 15 October 2018].